Face mapping is an invaluable tool for diagnosing acne. So get prepared for a really long post focusing on…face mapping for acne! Some of these face maps will seem contradictory and some will not resonate with you. Listen to that. Only take what feels right. I will begin with the simplest. This is basically what most people have seen when they think of face mapping for acne. This one is ok. But I don’t like that it doesn’t actually show you the zones. And it’s overly simplistic. There is actually quite a bit more finesse in face mapping. So don’t be surprised if you feel a little let down by this one. Let’s go deeper. I like that this one actually shows the zones. Some zones are very specific and small and skinny. For example, you see the forehad has 3 distinct zones: small intestine, bladder and heart. So depending on EXACTLY where you are breaking out, there will be very different things to address. Just saying “forehead” broadly is not enough specificity. Notice the similarities and differences between this one and the following one. Usually when healing acne, we first look to the body’s major elimination and detox systems – digestion (stomach, small intestine, large intestine, colon) and liver. But if putting digestion and liver healing protocols in place does not heal the acne, we have to look at the health of other less famous organs in the body like the bladder, gallbladder, pancreas, spleen and kidneys. The organs are all vital to the correct processing of food, toxins and hormones. I like this one because a lot of Chinese face maps (like the very first one I showed) show the cheek area as “lungs.” And I can just imagine all the people out there with breakouts on their cheeks being like. WTF. I don’t smoke? You can see on this one, that the cheeks are actually colon, stomach and lungs. For the majority of people breaking out on the cheeks consistently, the issue is gut/food related, and can usually be resolved by cutting out “mucous forming foods” like sugar, dairy and certain carbs and increasing intake of water, fiber and healthy fats to help digestion. This one also includes the spleen. As mentioned above, sometimes the more peripheral organs are the actual issue. The spleen for example, is the largest organ in the lymphatic system. If it is underperforming, it will stress the liver and lymph nodes, which will try to help it with its main job of blood purification, and so become less efficient/effective in their own duties. Right along the mouth and the nose are two strips that can give us more info. Especially if you’re breaking out around your nose and your diet is “healthy,” consider not eating so much raw, hard to digest food, like nuts, uncooked veggies and whole grains. For starches, eat potatoes and rice. For meats, simply cooked chicken and fish, and for veggies, simply seasoned cooked veggies. Also note that the chin and jawline are classic places that point strongly to hormonal acne, but hormonal acne can also show up in the “Endocrine strip,” section 5. Next is an AYURVEDA face map. So far, we’ve been focusing on Chinese medicine. Notice the similarities and differences. In Ayurveda, the cheek is digestion. Also, if you tend to break out on neck or chest, the things I most commonly see causing this are stress and illness or both. I like that Ayurveda also takes into account emotions and stress when healing acne, because these are huge factors. Loosely speaking, forehead breakouts are related to stress, worry, anxiety. Mid-face breakouts are related to anger, discord, frustration, and other “fiery” emotions. Cysts (deep, fluid filled breakouts) and breakouts on the bottom portion of the face are related to the inability to process emotions and traumatic events, holding on to emotions, and not being able to let go of or fully process hurt, sadness or other negative emotions, including self loathing and low self esteem. Lastly, these are not face “maps” per se, but these are 2 handy charts that help “map” the type of acne to the cause, so read through and see if anything resonates. This first chart allowed me to make the connection between my blackheads and my liver. The second helped me connect my forehead breakouts to stress. Lastly, I will say this. 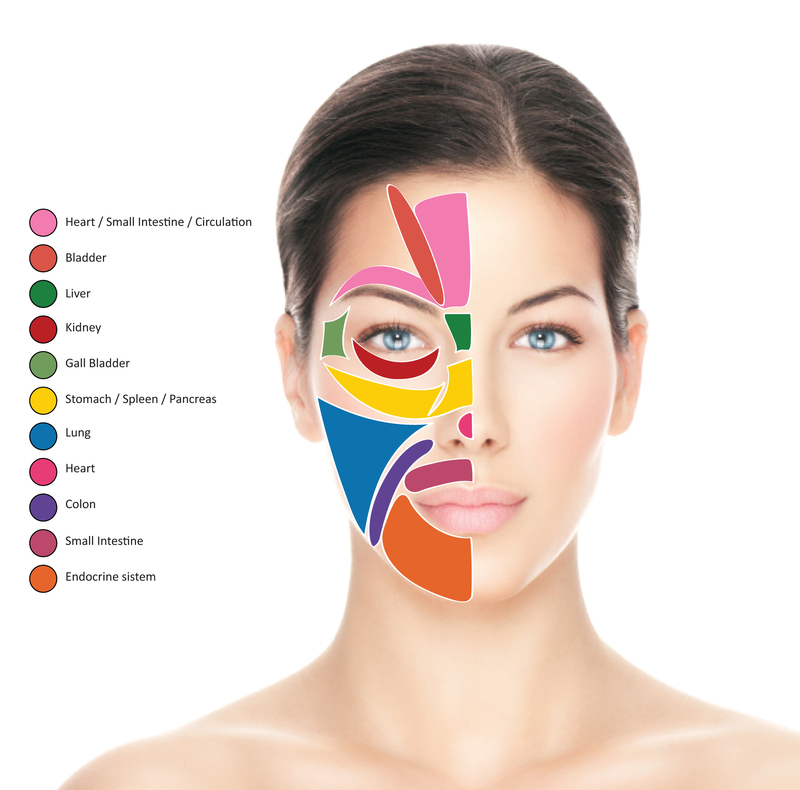 A lot of times where we see breakouts on our face has a really unsatisfying or hard to resolve interpretation on the face map. 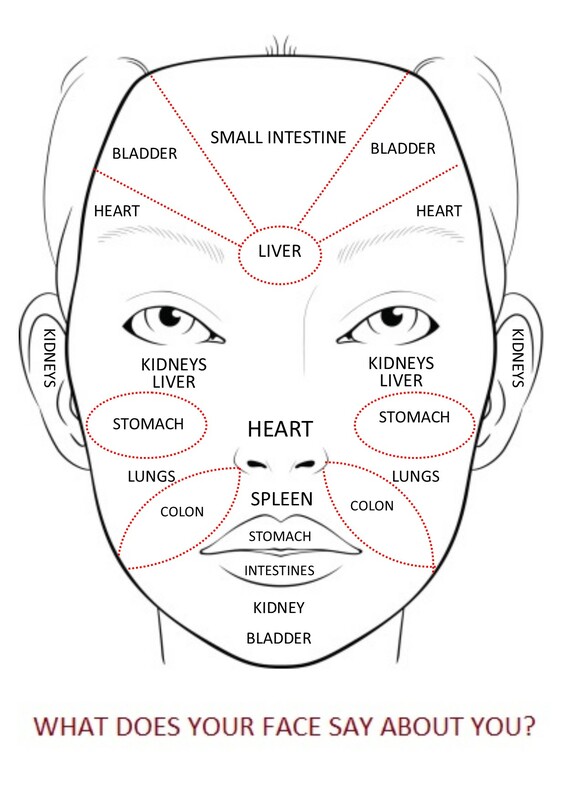 For example, if we see breakouts on the nose, the traditional interpretation is “heart.” Or the cheeks indicate “lungs.” Or the forehead “bladder.” Mostly by now, we know that acne is either digestive or hormonal in nature, so if we see “colon” or “endocrine system” or “hormones,” it makes sense and we accept it. But what do we do with a result like “bladder” “heart” or “lungs?” I will speak briefly about these 3 now. If you have questions about any others, let me know in the comments. Bladder is ALSO triggered by stress, especially HEART emotion. If you are fighting, going through a break-up, if there is any stress caused by relationships or love, then deal with it. Practice some sort of breathing meditation. Increase breath and/or fitness. Breath and heart health are intimately related in Ayurveda. Attend to emotions and grief – give yourself space, compassion and time for healing. Blood may be toxic/unpure. Eat blood purifying foods like beets and consider a blood purifying supplement like Burdock Root. Decrease toxins through adjusting diet and environment. Eliminate or severely decrease mucus forming foods like dairy, unhealthy fats, meats, sugar, starch and cold or heavy foods. Increase foods that are light and dry and bitter, like leafy greens, veggies and spices. Practice some sort of breathing meditation. Increase breath and/or fitness. Moving breath combats stagnation and congestion, two huge issues with acne. Lung is also in charge of waste and connected to large intestine. So make sure you are eliminating properly and consider increasing fiber/water/healthy fat to help bowels. Finally lung is sensitive to dryness, and temperature extremes, things that can also aggravate acne. Make sure you are hydrating skin and body. Again, lots of water and healthy fats internally, and topically, moisturizing serums/essences and/or oils or balms. Signing up for emails doesn't commit you to anything - but it is a great way to learn a ton about healing your acne holistically, through lifestyle and diet. If you do want to join the Cleanse, be sure to get on the email list though - we'll be sending a special offer that will ONLY be available to email subscribers. Use code GOODBADWEIRD at check out to save over $100! Visible improved, clearer skin is guaranteed from the only Candida Cleanse designed for acne-prone skin. Posted in Clear Skin Sanctuary, Uncategorized and tagged holistic skincare advice. wow, thank you for this comparative analysis! i have never seen anyone else do this before and i’ve googled face acne charts many times. i’m so glad i found your work. to several friends ans additionally sharing in delicious. And certainly, thank you on your sweat! I’ve had blind postules in the exact same location on the sides of my nose in my smile lines. This appeared out of nowhere when I turned 30. Eliminating gluten helped tremendously but I still struggle to find a cure to this. I have tried everything and am recently seeing an allergist to have testing done. Western medicine has proved useless. Any recommendations for this area that the map correlates with the colon, large and small intestine? Maybe Digestive enzymes? Aloe? Candida cleanse? Love this! Can you please include references / sources? I’d love to dive in even more. There should be links in the article. If there are no links, then the reference has unfortunately been lost. I keep seeing colon for mine. I have no idea what that means. I know what a colon is but I have no idea where to even begin with that information. Any tips? My acne all of a sudden started out of nowhere. I had perfect skin up until 9 months ago. Google “Acne and Parasites”. It could be you are infected. Try different cleanses (herbs/enemas/cabbage juice) and don’t forget the emotional healing as well. This is so incredibly helpful!! Thank you so much for posting!! Very interesting! I’ve seen face mapping before but, never explained so well or this in depth. I was wondering what your recommendations for the liver are? It seems like that’s what causes blackheads. Thank you!